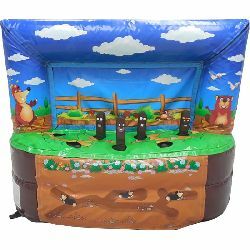 This Whack-a-Mole game is fantastic for 1 vs 1 or 2 vs 2 players. The idea is to start by having an equal number of moles visible on each side. Players then hit the moles on their heads as fast as they can so that the opposite player has more moles above the surface than you do. As you hit one down, the one on the other side will raise up. After 20 seconds or so, the player with the most moles hit down is the winner.